Offering the perfect blend of casual sophistication and alluring oceanfront accommodations. 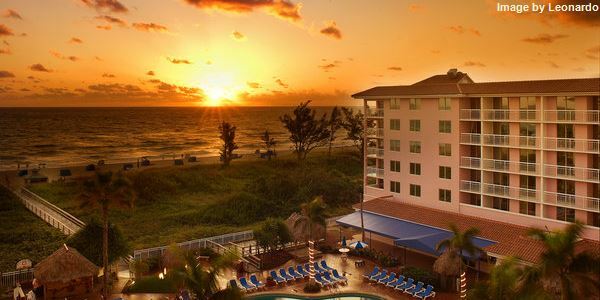 Guests enjoy a mulitude of entertainment opportunities at this oceanfront all-suite beach resort. Just minutes from Singer Island and a short walk to AT&T, Thermo Fisher, and Lockheed Martin. Located directly on the Intracoastal Waterway with Jupiter Beach. Nearly perfect yearround weather, miles of beach, and a exciting variety of outdoor and cultural attractions make West Palm Beach the perfect destination for a fun-filled family vacation or quick romantic getaway. Golfers will find paradise at the courses of PGA National, while those looking for a more relaxing experience will find plenty of luxury resort spas. Spend a day on Peanut Island to see a bunker built for John F. Kennedy and enjoy a relaxing picnic. Looking to update your wardrobe? Designer boutiques and big name department stores make West Palm Beach the perfect shopping destination. Book your West Palm Beach vacation package today and don't miss a minute of the Florida sunshine.